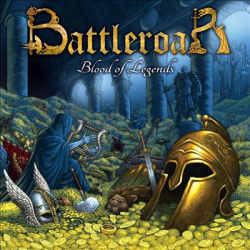 We haven’t heard for quite some time of Greek epic power metal band Battleroar, but six years after their last album To Death And Beyond…, they are now back with their fourth longplayer Blood Of Legends. Half of the line-up has changed, and between touring and the musicians’ day jobs, it is understandable that things took their time. But therefore the new record is a good hour long and should delight fans of Cirith Ungol, Omen and the likes. At first your patience is demanded though. The intro Stormgiven, which reminds a little of Metallica’s Nothing Else Matters, is going on for a little too long. Why not just start instantly with a regular track? Take for instance the following The Swords Are Drawn, a prime example for melodic epic power metal. This is a nicely compact track that comes with the necessary drive. Next up is Poisoned Well, the only weaker piece on the album. It is quite long and doesn’t really find its momentum. The album could have done with this rather insipid moment. From here on, Battleroar finally find their shape and deliver one smasher after another. It is obvious that we are in the presence of fully skilled musicians. They may not get a prize for innovation, as they love to play with clichés, musically and contextually (cover, song titles, lyrics), but isn’t that what makes out this band? The following two songs are once again compact fast and melodic, and remind me of early Helloween and Gammy Ray, which isn’t that surprising, considering that Battleroar’s new vocalist is well known Gerrit P. Mutz who used to sing with German bands Dawn Of Winter and Sacred Steel. What sets Battleroar apart from other band is the use of electric violin which makes for a distinctive sound, especially on the dramatic The Curse Of Medea which starts out slowly before turning into a rousing moment not unlike Skyclad. Another highlight is the immediately following eight minute long Valkyries Above that also goes ahead full steam. The final track Exile Eternal is another eight minute long epic that shows the band from a quieter and more melancholic side. The three minute long outro consists mostly of ocean wave sounds and doesn’t really add to the album’s value. Blood Of Legends is all in all an excellent album, even though it doesn’t quite reach the class of its predecessor, which so far has been Battleroar’s milestone work. Nostalgic power metal fans should be fully satisfied though. Disregarding the intro and the outro, we still get seven winners out of eight tracks, and that is quite a respectable score.